On November 4, SNU students taking the “Veterinary Surgery and Laboratory 2” course offered by the College of Veterinary Medicine went to an animal shelter in Namyangju-si. In order to help the abandoned animals, they put into practice the skills they had learned in class. 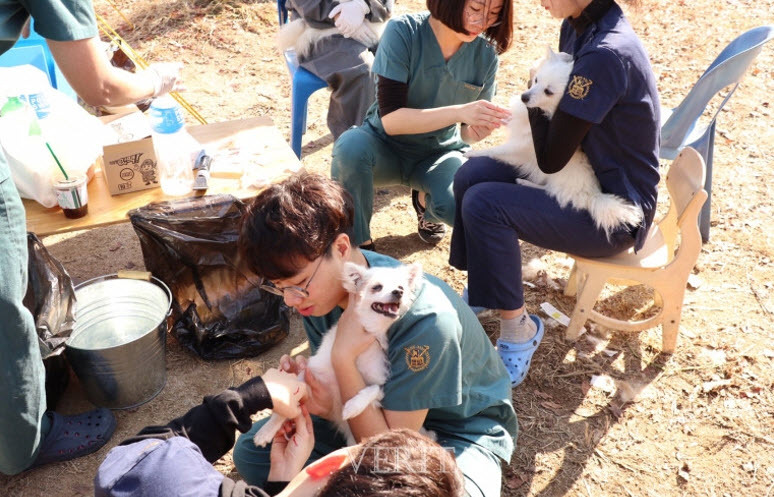 Under the guidance of Professor Kweon Oh Kyeong (College of Veterinary Medicine), they performed medical checkups, as well as vaccination and neutering for the shelter animals. The course “Veterinary Surgery and Laboratory 2” is part of SNU’s efforts to offer students a chance to contribute to society by applying the knowledge they acquire through their respective majors. This curriculum aims to increase the students’ understanding of social responsibility as well as foster within them the spirit of volunteering. SNU students’ efforts to help abandoned animals are not limited to the official curriculum of the College of Veterinary Medicine. Tails is a student-organized volunteering club at SNU that carries out various projects to help abandoned animals. Tails members raise funds for and volunteer at animal shelters, increase awareness of animal abuse, and host seminars and exhibitions highlighting animal rights. “Every time I see the abandoned animals in person, I realize that animal abuse is a major social issue that needs to be addressed. Participating in Tails is meaningful for me in that I can really feel that my help, however small, has the capacity to change the lives of those animals.” Yang Yunseong (Department of Economics), a member of Tails, said.